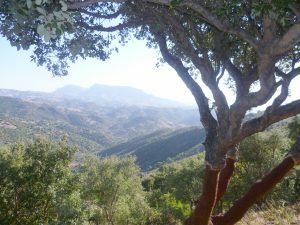 It’s been a chilly, damp week and I’m longing for a bit of sunshine, so today I’m revisiting sunny Sardinia, a fascinating island, full of interest. And it’s a beautiful country, especially up in the mountains. I actually went there to see the Bronze Age nuraghi. These are large stone-built towers, two or three storeys high, sometimes standing alone, but sometimes as part of a complex of towers, courtyards, wells and hut circles. What intrigued me about the nuraghi – and there are thousands of them scattered all over the island – was they looked very like the brochs you find in northern Scotland and the Northern Isles. Were they similarly defensive structures, I wondered. What were they like inside? As you can see, there’s an inner wall and an outer wall. In some of the better-preserved nuraghi, there are stone stairs and, at the top, you can look down over a complex of Bronze Age hut circles. 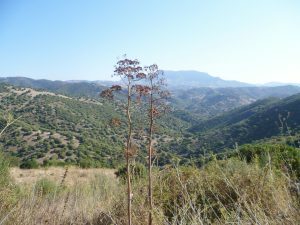 Archaeologists have discovered pottery jars, bread pans and vessels for boiling milk in excavated nuraghi which shows that they were at the centre of a thriving farming community, and numerous sheep, goat and pig bones tell us what they were eating. They kept cows for milk as well as for ploughing. 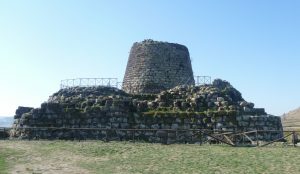 Nuraghi seem to have been multi-purpose, built partly for defence, partly for a chief to live or be buried in, and partly as a centre of authority and power within the area, as with the Santu Antine tower, above. 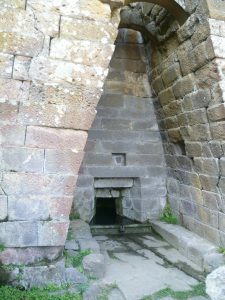 Su Tempieru is one of the most famous nuraghic sites because of its sacred well, discovered in 1953 by the local farmer and excavated in the 1980s. It is exceptionally well-preserved due to a landslip in the Early Iron age; you can see how sharp the edges of the stonework are. The scenery is splendid, too. You can only get to the well in a 4 x 4 and there is a steep walk down to the actual site. 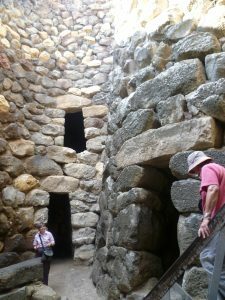 The Bronze Age Sardinians were sophisticated water engineers, and they built a complex system of drains and cisterns to channel water to where it was needed throughout the island. 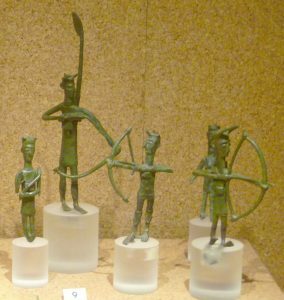 And then there are the bronzetti, small, almost cartoon-like, bronze statuettes. I’d never heard of them before I went, but I just love them; they are so animated and full of movement. 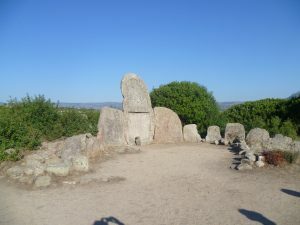 They are found all over Sardinia, in nuraghi and in tombs. A hundred and twenty-eight of them were found by the Su Tempieru wells, probably as votive offerings. 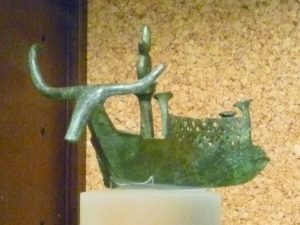 The strategic position of Sardinia is central to its history, and this bronzetti boat is a reminder that the nuraghic people traded all over the Mediterranean. I love this bronzetti. 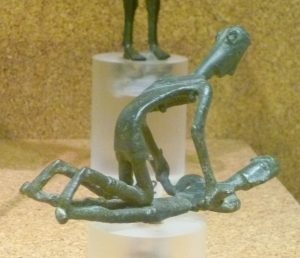 Interestingly, other ancient peoples around the Mediterranean seem to have liked and wanted to own bronzetti. A number of them have been found in Etruscan tombs and I’ve seen them in museums all over Italy. I even saw one in a museum in Crete, recently. They obviously became the tomb accessory of choice quite early on. I found myself wondering if the 20th century Swiss sculptor, Giacometti, famous for his stick-like men, was influenced by nuraghic bronzetti. 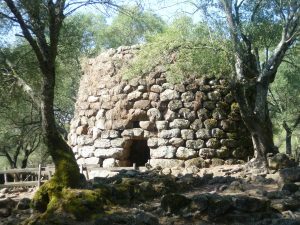 I’m ending with a photo of one of most impressive of Sardinia’s chamber tombs which dates back to the early Bronze Age. Unfortunately, it doesn’t really give a sense of scale, but one of the visitors went down on all fours and poked her head inside the hole at the base of the central stone. Alas, I didn’t take a photograph of her. Love these. Especially the bronzetti. Had never heard of them either. Fascinating little pieces of art. So interesting. Thank you, Elizabeth. What I love about bronzetti is that the figurines represent ordinary people and their everyday lives: fighting, wrestling, dancing, with their boats and cows and so on. And they are just the right size to pick up and look at.